The Digital Research Library of Illinois History Journal™: Abraham Lincoln's Nomination in Chicago in 1860. 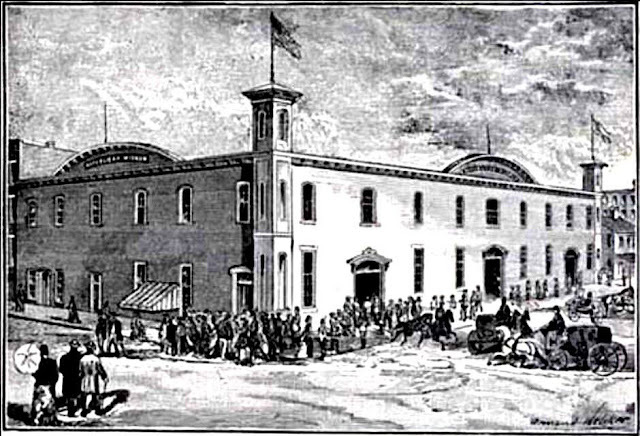 Abraham Lincoln's Nomination in Chicago in 1860. Probably the most shocking political event to occur in Chicago in the middle 1800s was on May 18, 1860, when Abraham Lincoln was nominated for the Presidency of the United States in a two-story wooden hall called the Wigwam. It was a carefully engineered event and one that almost never occurred. To this day, there are still many who are pondering the mystery of how a minor contender in the presidential race managed to achieve a sweeping victory with the third nomination ballot. They key to solving the mystery is Chicago itself. Lincoln's supporters, who had fashioned the man with the image of a backwoods rail-splitter, were thrilled that the event was held in the city. 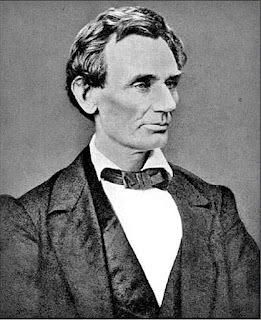 Lincoln was an Illinois man and had many friends, along with newspaper support, on the prairie. The Republicans were holding what was only their second national convention and for the first time, had a chance to usher one of their candidates into power. The dominant Democratic Party was split over the issue of extending slavery into the territories and their divided vote gave the Republicans hope. Coming into Chicago, the favorite to win the nomination was New York senator William H. Seward and his supporters and delegates were so assured of his victory that they focused more on his choice of running mate than on his actual nomination. 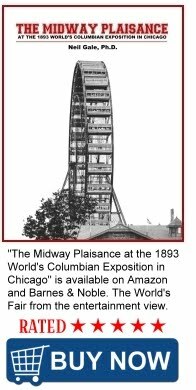 The old Chicago Wigwam. The building in which Lincoln was nominated for the Presidency. May 18, 1860. The convention opened on the morning of Wednesday, May 16 with over 10,000 people packed into the Wigwam, while an additional 20,000 stood outside. Four years earlier, in Philadelphia, the Republicans had drawn no more than 4,000 people to their convention. The meeting was called to order and was followed by a stirring address from David Wilmot of Pennsylvania. After that, the remainder of the day was spent electing a chairman and constructing a platform. The platform was adopted and modified on Thursday, with the first ballot scheduled for later that evening. Many expected Seward to be chosen by a landslide, so a chorus of groans greeted Chairman George Ashmun when he announced that the printers had failed to deliver the tally sheets. Since no vote could be taken, a motion was adopted to adjourn until Friday. Inside the Wigwam at Chicago on May 18, 1860. Lincoln's campaign manager, David Davis, was thrilled. He and his compatriots, who included Lincoln's long-time friends Ward Hill Lamon, William H. Herndon, and Stephen T. Logan, saw the delay as a sign from God. Led by Lamon, a number of Lincoln's friends began scrawling the names of convention officers on admission tickets while Norman B. Judd, a railroad attorney, arranged for special trains to bring more Lincoln supporters to the city. While Lincoln's men worked behind the scenes, Seward's followers publicly declared their man the winner and even put a brass band into the streets on Friday morning. They marched from their hotel to discover that the Wigwam was so crowded that few people other than delegates were able to find seats. 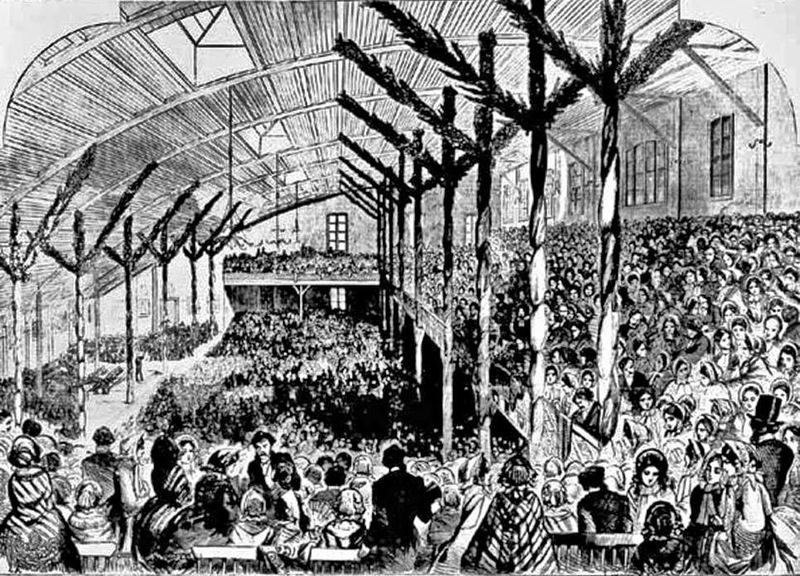 The bogus tickets that had been passed out by Lincoln's men had been used in such numbers that the hall was now packed with his supporters. The first roll call of the states gave Seward 173.5 votes, but 236 were needed to win. 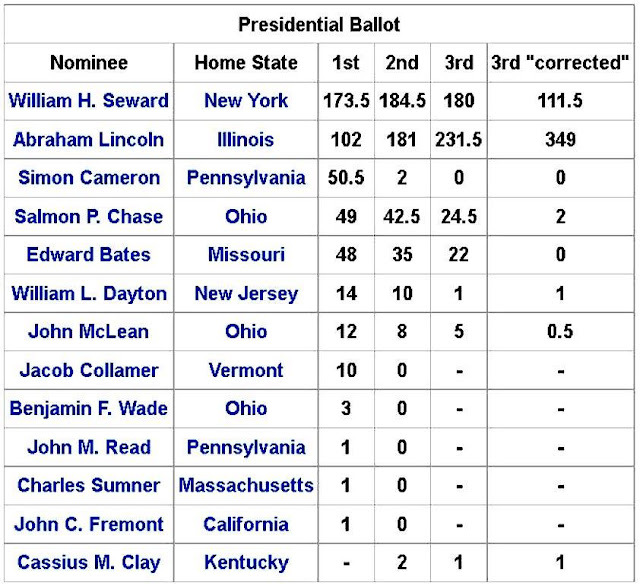 Lincoln followed with 102 votes, with Simon Cameron of Pennsylvania, Salmon P. Chase of Ohio and Edward Bates of Missouri each receiving about 50 votes. Recognizing that Pennsylvania would be crucial in winning the nomination, David Davis arranged for delegates of that state to be seated between Illinois and Indiana, both of which strongly backed Lincoln. He then convinced the delegates from Pennsylvania that if Seward won the nomination, the party would lose the election. As a result, Cameron withdrew. When the second ballot was tallied, it offered a stunning surprise, especially to Seward's supporters. Their candidate had only gained 11 votes but Lincoln's total had increased by 79. That left Chase of Ohio in third place with 42.5 votes. Workers in the Lincoln campaign had been busy contacting delegates from every state, using a deceptively simple strategy. Instead of asking for votes on the first ballot, they persuaded as many men as possible to make Lincoln their second choice. They also stressed the contrast between Lincoln and Seward. Lincoln had been guarded in his campaign so far and had been careful not to offend anyone. Seward, meanwhile, had made his position clear on most national issues. Seward was the only nationally known Republican who had allegedly praised John Brown's recent attack on Harper's Ferry and had hinted at a civil war by warning that an "irrepressible conflict" seemed to be coming because of slavery. Lincoln, on the other hand, was on record as opposing the extension of slavery into the territories, but he also underscored the conviction that slavery where it existed was lawful and that it should not be challenged. He believed that the institution would eventually die out. It was obvious that there was a sharp contrast between the familiar candidate with controversial views and the little-known rival who was not nearly so eager to enter into war, but the contrast was not enough to allow Lincoln to win on just those merits. Lincoln's managers seemed to be willing to promise almost anything to those who would back him. Legend has it that Lincoln sent a telegram to Davis from Springfield that instructed him to make no bargains. "Make no contracts that bind me," he allegedly wrote and it has been said that Davis used that message to show to those who hesitated in backing Lincoln that the candidate was not offering positions in his administration with a free hand. Legend tells otherwise, though, and stories have since been told that Davis managed to persuade delegates to abandon their favorite candidates with promises of positions in Lincoln's cabinet. Whatever happened in Chicago's notorious "smoke-filled rooms" remains a mystery. What we do know is that when the third ballot was taken, Seward had lost 4.5 votes and now needed 56 to win. Lincoln however had gained 53.5 votes and was within 1.5 votes of the nomination. The interior of the Wigwam became nearly deafening with the mingled shouts, cries and laughter of the assembled party. And as soon as he could be heard above the commotion, David K. Carter of Ohio jumped up and shouted that five of the delegates from the Buckeye State wanted to switch their votes over to Lincoln. When the commotion subsided again, other states began to call for Lincoln as their new nomination. After all of the 466 votes had been cast, Lincoln had 364 of them -- 128 more than the number he needed to win. But how did Lincoln manage to pull of such a sweeping victory? Did his campaign managers really trade positions for votes? No one knows and nothing was ever documented that said for sure either way. Journalist Charles H. Ray, a member of Lincoln's inner circle, later said that the managers promised Indiana and Pennsylvania anything and everything they asked for. Carter of Ohio, who started the dramatic third-ballot uprising, was said to have been promised a high level cabinet position and while other rumors abound, nothing has ever been proven. One thing is clear, though. Many who stepped aside for Lincoln, or who worked for him behind the scenes, were chosen for important posts. Seward was made secretary of state; Chase received the Treasury Department portfolio; Cameron became secretary of war and the fourth contender for the nomination, Edward Bates, became Lincoln's attorney general. David Davis had hoped to become a federal judge and was appointed to the U.S. Supreme Court in 1862. Ward Hill Lamon, who created all of the bogus tickets, became marshal of the District of Columbia. William P. Dole, who was credited with securing the Indiana and Pennsylvania votes, was named commissioner of Indian Affairs. And the list went on. Abraham Lincoln is today considered one of the nation's greatest presidents, but his nomination to that office came very close to never taking place. If not for backroom politics, he might not have made it to the White House. In this case, it's a good thing that the convention was held in Chicago - where questionable politics are the accepted method of doing business. By Troy Taylor, Adam Selzer and Ken Melvoin-Berg. The White Squirrels of Olney Illinois. Chicago's Other German U-Boat, the UC-97. Cemetery History of Early Chicago. The Kiosk Sphinx in Chicago, Illinois.